Bees, spaceman, blue tubes, and boxes! There are many devastating challenges facing us if we lose the precious honey bee through colony collapse caused by climate change and unsustainable use of herbicides and pesticides. Through apiarist Britt Hopper’s own passion for the bees and Robin Macy’s Bartlett Arboretum ecosystems, both have discovered that the tenuous ecological future lies as much in the hands of our youth as it ever has throughout all of human history. In 2013 Hopper helped Bartlett Arboretum establish their bee colony, now numbering eight hives. In addition he is presenting Bees 101 (his bees and presentation about the bees, and bee-sticks full of varied honeys) for Second Sunday Salon — A cornucopia of Culture programming held in Bartlett’s historic train depot. Nestled in a 100-year -old forest canopy, the 135 -year-old Santa Fe Railroad depot is located at the edge of the Arboretum property. In 2013-2014, the depot became a restored sunny studio that attracts a creative community inspired to escape to a rural retreat to create , educate and be inspired just 20 miles south of Wichita, Kansas. 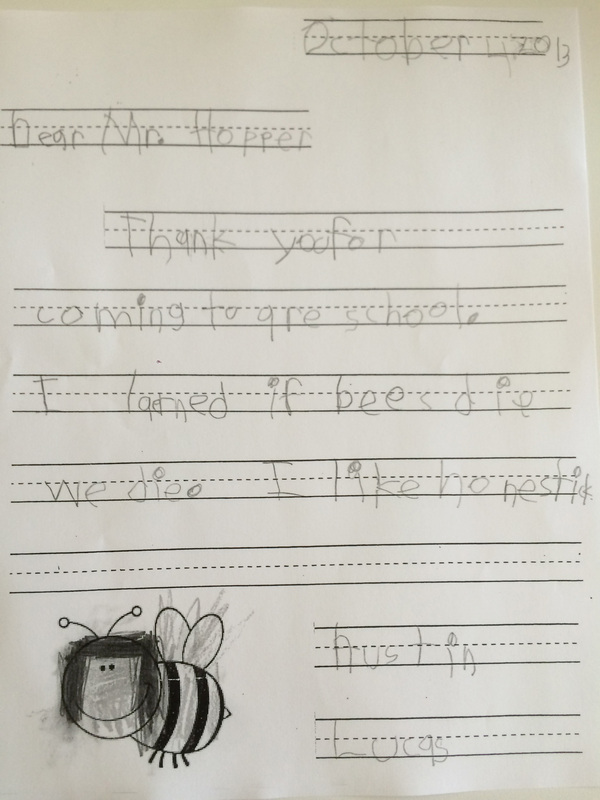 Also, at the same time Hopper took Bees 101 to more than 500 students in schools throughout central Kansas. With Amaterra’s grant, Hopper will be able to expand the number of hives both at his home-base in Valley Center, Kansas and the Arboretum in Belle Plaine, Kansas. The goal is to increase honey production by 30% and support local pollination. Hopper will work with educators Connie Bonfy MAE, Nancy Holman MSE, and Robin Macy MSE to create Bee Happy — Bees 101educational activity book for youth grades 2-5. The activity will contain curriculum-specific activities in science and arts infused with activities by grade level to help students learn and retain the information he demonstrates and shares with them during classroom visits. 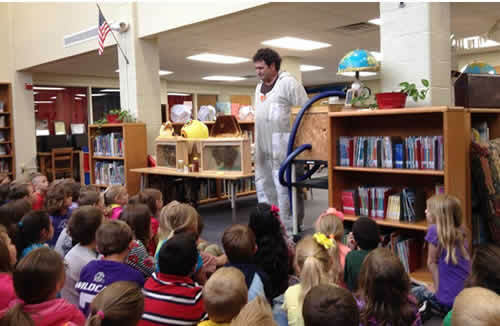 As an aid to their grade level science curriculum, Bee Happy will help classroom educators teach Kansas youth about bee colony collapse as well as the broader issues of climate change and the other negative forces that threaten the health of bees thereby reinforcing Hopper’s presentations. Through Amaterra’s support Hopper will be able to increase Bees 101 presentations to students both in the schools and Bartlett Arboretum school tours (30 classes per year) to reach at least 1500 students grades 2-5 each year beginning in the 2014 school year. The Kansas State Department of Education has adopted A Framework for K-12 Science Education Practices, Crosscutting Concepts, and Core Ideas(2012) as the core science curriculum and standards of what students should know and be able to do at each grade level. This core curriculum along with art standards for each grade level will be used to develop Bee Happy which will contain puzzles, games and art projects that children can enjoy while learning in the classroom and at home with their families. Grant arranged by Amaterra member Jerry Harney and grant writer Connie Bonfy. I am very humbled and very grateful. Your generous gift means so much to Bee University/Bees 101. I’ve been doing this on my own. Teachers would ask if I would come teach about bees. They would inform me there is nothing in the budget to have me come. But would I come anyway? My answer has always been yes. Sometimes teachers try to bless me out of their own pocket. $15. Every now and then. I never asked for compensation from them. The Honey Bee is one of a kind. The benefits from the honeybee and the hive is a major lifeline for all mankind. So to change the future I’ve taken the importance of the honeybee to children. With your help it will be done to more schools and to more listening ears. Ears that can change the environmental course that we are on. The end result a better future a healthier world. I am very grateful and humbled by your generosity and support. Thank you! We say/hear that every day thank you. I’m typing it in this letter it’s often taken for granted those simple words. But for me I’m screaming inside on the tallest hill Kansas has to offer with gratitude. Thank you. Thank you for being a game changer. Thank you for caring for the future of children and mankind everywhere. In 2012-13 Amaterra has provided a $1000.00 micro-grant to support the ZEROwaste project in Albuquerque, NM. The project was devised by an employee from Soilutions, Inc., http://www.soilutions.net/, named John Shaski (Ski). The premise of the project is to engage and encourage both vendors and market attendees about the process and importance of waste classification and sorting. During the Downtown Growers’ Market trash cans are removed and collection stations are set-up throughout the public park. Each station asks people to sort their trash into three categories, recyclables, compostables, and trash. At the end of each growers’ market Ski takes the recyclables and compostables, and leaves the remaining trash for the Downtown Albuquerque Action Team. The team is responsible for cleaning the park and disposing of the trash after the growers’ market. The ZEROwaste project currently is supported by volunteers with some support from Soilutions Inc. Soilutions Inc. provides the containers at each sorting station and a truck to haul the recyclables/compostables away. This is not a money making venture for Soilutions Inc. or Ski, but a means to introduce waste reduction and management concepts to participants at a community event such as the local growers’ market. Amaterra determined that the best way to support this project would be to provide funding for the creation and production of educational materials detailing the classification and end-use pathways for each type of waste material collected at the growers’ market and to provide an annual report detailing how much waste was collected and then diverted to either a recycling or composting center. The goal of this project is to help educate not just the general public but also local decision markers about the importance of sorting the waste that is generated at community events. If this project is successful it can be scaled to include other growers’ markets in the Albuquerque area, and possibly other community events. The project was arranged by our Vice President, Shawn Hardeman, supporting this endeavor with direct community involvement. As team leader for the ZEROwaste initiative I wanted to contact you in appreciation for the Amaterra grant we received. In our 2011 effort to collect and recycle ALL waste generated at the Downtown Grower’s Market we managed just over one ton of material. 84% of that material was found to be readily recyclable. Our success flies in the face of assumed public apathy and highlights the inadequacy of the available infrastructure. We are currently engaged in a re-branding of the ZEROwaste_initiative that will raise its profile substantially. Future plans include expanded infrastructure and manageability that will allow us to broaden the scale. More eyes and ears, more material recovered, more momentum towards a more efficiently managed waste stream. Please kindly take stock in the nurturing role Amaterra has taken in this endeavor. We’ll be sure to let others know. This project uses giant sea life sculpture made entirely of marine debris to teach children and adults how to help save our seas. A $1000 grant in 2013, arranged by Board member Joe Swaffar, helps develop educational materials for the classroom.